The Howard County Youth Hockey Club is proud to be the host of the 2016 U.S. Eastern Regional Silver Stick Tournament November 25-27, 2016. This is a “Stay to Play” tournament. As a condition of acceptance to our tournaments, all out-of-town teams must stay at an authorized WST Sports Silver Stick tournament hotel that can be accessed online at www.wstsports.com once you fill out a tournament application. Please do not contact the hotel directly. This tournament is proudly hosted by the Howard County Youth Hockey Club aka The Howard Huskies. The game schedule for this tournament has been posted by the host club, on the Howard Huskies web site. Standings for all age groups will be updated in real time as games end. Click below for standings for a particular age group. Schedules for each age group and division will be determined once registration is closed. Games will for each division and age group will be scheduled at one or more of the following venues. Create an account on Statmonsters.com, or login to your existing account to submit a registration for this tournament. 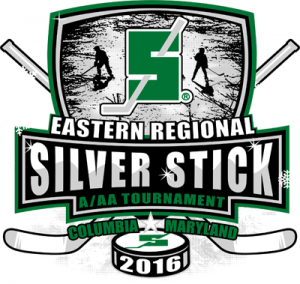 Once logged in, create your team via the StatMonsters.com dashboard, and then submit a Registration request for the 2016 Eastern Regional Silver Stick tournament. The host club requires that you provide the following before your registration will be approved. This region uses the four (4) sticker system for score sheets. You must provide three (3) standard labels for the scoresheets, plus a fourth detailed label including each player’s USAH # for the back of the scoresheet. A minimum of four (4) and a maximum of eight (8) teams per age level will play three (3) games guaranteed, plus playoff’s if eligible. Format to be determined based on total number of teams participating at each age level. Divisions will consist of either 4, 6, 8, 9, 12 or 16 teams depending on final registration numbers. Each age level Champion is expected to participate in the Silver Stick Finals held in January of the following year at locations in either Michigan or Ontario, Canada in January of 2017. As a reminder, any travel outside of the US after 12/31/08, requires each member of the traveling party to possess a valid passport. Please plan accordingly. Final roster information must be submitted by no later than October 25, 2016. Games will begin at 7:00 am on Friday, November 25, 2016. All teams must be prepared to play at that time. Cancellation Policy – Refunds of registration fees for cancellations will only be made if the sponsors can backfill the team position in the tournament. The sponsor reserves the right to use financial incentives to fill the void left by cancellations.